Comment: This book is in good condition. Mild shelf ware. Binding tight and intact. Ships direct from Amazon Canada. Jodey Castricano is an associate professor in the Faculty of Creative and Critical Studies at the University of British Columbia (Okanagan) and has long been an advocate of animal rights. Research concerns extend to the history of ideas in the nineteenth century, particularly in the context of Darwinian theory and the development of psychoanalysis. Previous publications include Cryptomimesis: The Gothic and Jacques Derrida’s Ghost Writing (2001). Gothic Subjects: Literature, Film, and Psychoanalysis is forthcoming from University of Wales Press. She is the editor of Animal Subjects (WLU Press, 2008). 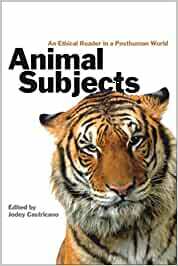 In this volume Jodey Castricano has gathered together an interesting and challenging series of articles that address ethical issues arising from our treatment of animals. The viewpoint is one that is pertinent to Cultural Studies. The collection will be of interest to those who already have some background in the areas of ethics and our treatment of animals and our conception and understanding of them - this latter area being one more of ontology than ethics. The writing is varied and will sometimes strike a reader trained in the analytic tradition as a little offbeat in its approach. The strength of the collection is in its diversity and its difference from existing literature on the subject. The weakness is that the relativities of postmodernism are not given more prominent analysis and defence even if that defence were couched in terms other than the analytic. 'It is possible for aquaria to conduct educational programs and to promote and interest in conservation and protection of animals. However, it is widely agreed that the educational services currently provided by these institutions typically remain superficial, offering approximately the same level of information that might be gained from browsing through any popular book on animals'. Angus Taylor, `Electric Sheep and the New Argument from Nature', addresses an important argument that conservationists sometimes appeal to in rejecting demands for the rights of individual animals based on sentience. For many conservationists it is species, rather than individuals, that matter. Further, the argument is advanced (and rejected by Taylor) that what is natural is also what is right. Thus, (it is suggested) having evolved as omnivores it is right that humans continue in that habit. Taylor rebuts that position. Ecologists, environmentalists or conservationists who argue that what is natural is right are still advancing a moral imperative, appealing to a non-natural property of the world. As David Hume pointed out in his distinction between the is and the ought, we cannot consistently argue that what is actual - such as the empirical fact that we have evolved as omnivores - is neither right nor wrong, but is also right! Thus, our treatment of animals cannot be justified by appeal to the natural order of things - us being the superior predator and therefore right in our oppression of animals. This argument conflates the difference between is and ought and commits Hume's fallacy. Michael Allen Fox and Lesley McLean explore the concept of moral space and suggest that we must develop new ways of thinking both about ethics and animals. In a chapter entitled `A Missed Opportunity' Paola Cavalieri looks at the big name Continental philosophers Foucault, Derrida and Levinas. Although she finds some sympathy for animals in their work she thinks that they have missed the opportunity to adequately explore the animal issues pretty much because their particular methodological approach prevents them from doing so. Castricano, `Introduction: Animal Subjects in a Posthuman World'; Haraway, `Chicken'; Preece, `Selfish Genes, Sociobiology and Animal Respect'; McCance, `Anatomy as Speech Act: Vesalius, Descartes, Rembrandt or, The Question of "the animal" in the Early Modern Anatomy Lesson'; Cavalieri, `A Missed Opportunity: Humanism, Anti-Humanism and the Animal Question'; Wolfe, `Thinking Other-Wise: Cognitive Science, Deconstruction and the (Non) Speaking (Non) Human Animal Subject'; Fox and McLean, `Animals in Moral Space'; Taylor, `Electric Sheep and the New Argument from Nature'; Sorenson, `Monsters: The Case of Marineland'; Seeber, `"I Sympathise in their pains and pleasures": Women and Animals in Mary Wollstonecraft'; Sztybel, `Animals as Persons'; Bisgould, `Power and Irony: One Tortured Cat and Many Twisted Angels to Our Moral Schizophrenia about Animals'; Dagg, `Blame and Shame? How Can We Reduce Unproductive Animal Experimentation? '; Tito, `On Animal Immortality: An Argument for the Possibility of Animal Immortality in Light of the History of Philosophy. The issues that arise from the interface of humans and non-humans continue to be one of the most revealing tests of the relevance and scope of moral philosophy and one, in spite of several decades of some very good academic minds working in the area continues to largely be ignored by the popular media. The issues involved not only are deeply troubling and difficult questions of ethics, but also depend on knowledge from a number of scientific disciplines particularly in establishing what kind of subjectivity we might ascribe to different species of animals. These difficulties are part of the reason why the popular media shy away from the subject, but it is also why many ordinary people don't engage with it - the topic is not only difficult it also calls for personal change that at the very least would be inconvenient for many. It is thus an important focus for Cultural Studies. This book, ranging over many aspects of the subject and including what we might regard as the question of what is central to ethics, is a worthy and original addition to the literature and anyone who reads it will find that its ideas continue to nag.